Super Savings Item! Free Shipping Included! 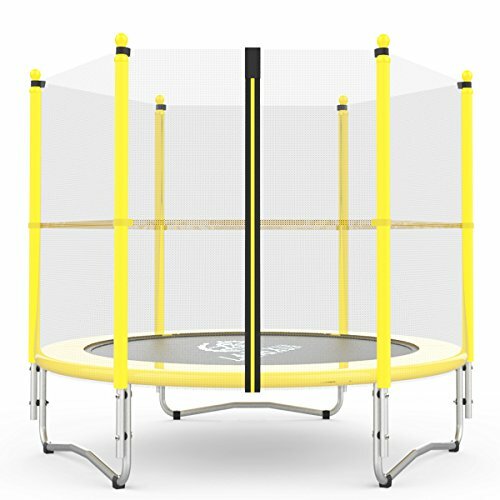 Save 32% on the Langxun 5Feet Outdoor & Indoor Trampoline with Enclosure net and Safety Jumping Mat Cover | Birthday Gifts for Kids, Christmas Gifts for Boy and Girl ( Yellow, 60inch ) ) by Langxun at Scruffs Game. MPN: LX-0703. Hurry! Limited time offer. Offer valid only while supplies last. Bring fun together with health and fitness to your home and family with this Complete High Quality Langxun 5FT Kids Trampoline and Enclosure Set! Bring fun together with health and fitness to your home and family with this Complete High Quality Langxun 5FT Kids Trampoline and Enclosure Set! This trampoline is both durable and padded to provide hours of safe, active fun for your little bouncers. The frame is made of high-quality steel and durable, blow-molded plastic to ensure safety. Round zippered entrance enclosure net is supported by padded poles for added safety and 100% assurance of a secure fun jumping experience for your kids and their friends! The cold weather is coming and children are no longer fit to play outdoors.Are there any interesting and health indoor sports? Yes, of course.The langxun trampoline is.This is an indoor and outdoor trampoline.When the weather is sunny, can carry it in the yard, and when in the cold winter and rainy day, no longer suitable for use outdoors trampoline and other sports, the Langxun trampoline can continue to use in indoor, the right size and the color of beautiful beautiful, let your honey indoors can have a fun and healthy indoor sport. WEIGHT LIMIT: Trampolines should only be occupied by 1 person. This trampoline is made for kids and our warranty covers up to a 220 lbs weight limit; however, the trampoline could actually support up to 330 lbs. Easy to handle.Indoor and outdoor use. SEAMLESS design between the enclosure and the mat, Never need to worry that your kids will get stuck in the gap.The design of external net is different from that of other trampoline, so the trampoline has more space and more beautiful and durable and comfortable. Galvanized steel frame with reinforced T-sockets stabilize the upper enclosure frame to the trampoline frame and prevents structural twisting. The customized robust safety net is manufactured from high density, tight weave, UV treated, PE thread. The heavy gauged 4 inch springs provide superior bounce and are rust resistant. Jumping mat is made from heavy-duty, UV protection polypropylene for strength and durability.The yellow color design makes trampoline look more athletic and dynamic. This Langxun trampolines get GS certified. Take Langxun trampoline home, take safe entertainment for your family. GS is German organization that work to validate the safety of products of all kinds to protect humans and the environment against hazards. All Langxun trampolines are German quality, safety assurance! Includes all necessary tools and hardware for easy and fast assembly.After you receive the trampoline, you can install it immediately.No additional accessories or tools to install.